This is the last recipe from Christmas I have to post. I actually made it for us for dinner last night because I had coupons for croutons and sausage and Mike really likes it. Thanks for the recipe Mom :-)! Grease 9 X 13 inch pan. 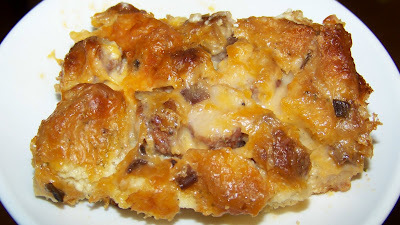 Layer Croutons, cheese and cooked, drained sausage. Beat eggs and 2 1/2 cups milk. Pour over ingredients. Cover with foil and refrigerate overnight. In the morning, Mix mushroom soup and remaining 1/2 cup milk. Pour over eggs. Bake, uncovered, at 300 degrees 1 1/2 hours, until brown. Ooohh I want to try this! We LOVE any and all kinds of breakfast casseroles! Glad you guys like it. I'm stealing this picture... k?